The WiseHooker™ is a quality innovation that makes BBQ grilling safer and easier than ever. The unique design combines the functions of several tools in one! 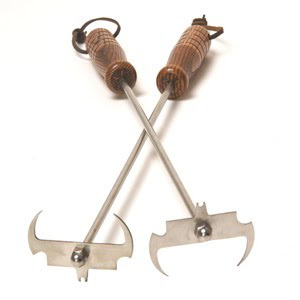 Does the job of a grate cleaning tool, grate removal tool, tong, fork, spatula and more. With just a quick flip of the wrist securely and quickly lift and turn: meat, fish, poultry, vegetables, hamburgers, hot dogs, & more! Cleans better, safer and cheaper than wire brushes or other cleaning tools. Simply push the grate cleaning side of the tool back and forth using the correct size notch. Clean the underside by “hooking” under the grate with the hooks and push back and forth. Underside cleaning reduces flare ups. Very efficient, allows you to clean while you cook. Reviewed and strongly recommended by professional BBQ judges.